I've finally finished the video on cane pruning. It's only about a year late. I actually planned on doing a cane pruning video first but the footage was lost somehow so I just put the spur pruning video out there anyway. So I hope you enjoy the video. It shows me cane-pruning two vines using the French Double Guyot method. As always comments and questions are welcome. Enjoy! Great video! It will come in handy when my vines are big enough. I look forward to your next entry. How's everything going in your vineyard? Thanks for stopping by. It looks like my vines survived the first winter. I'll post a blog update after bud break. Good luck and may you have no post-bud break frost this year! Just keep with it and be patient. 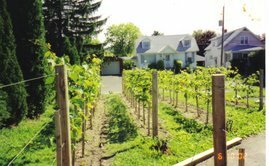 You'll be growing grapes and making your own great wine before you know it! Thanks for stopping by and please keep me updated, I'd love to know how your vineyard is progressing. Thanks...I put up the trellis tonight actually. I am putting them on a T type trellis. I wasn't sure what kind to go with and thought it looked cool. My buds are all swelling so I will keep my fingers crossed. I work with a guy who has an acreage and started a vineyard 2 years ago...it is co cool I just have to dabble. I think he does a lot of Frontenac as well...but has plenty of land and does all kinds. I am not sure if 7 vines will be enough to get me 5 gallons...what do you think? can't ripen that, then you will have to crop lighter. If they ripen too early you can increase your crop load. All he best to you. Thanks Dave...your knowledge is impressive...great advice. Great video. Just planted 8 Marquette last year in the Minneapolis area and they have grown to between 10 and 30 inches. Was glad to see them budding this spring but not sure what to do next, do I cut back to a couple buds from the ground or let these grow. You can either cut back to one bud and let that be your future trunk. When it gets to the height of your bottom wire then just cut the growing tip and let two lateral shoots start to grow, which they will. Or, if the shoots that grew last year are long enough, cut them at the length they need to be and let two buds up near the bottom wire grow. Scrape the rest of the buds below them off and those two shoots will be your fruiting canes next year. All the best! I am actually having the same problem...I have my vines growing in grow tubes and when you look in there is a mess of new growth (including grapes) within the tube. I am thinking I am going to have to remove the grow tube and find a vine to train and remove the rest of the growth. I was noticing you do not have any of your vines fenced off. Do you have any problems with Rabbits where you are? I was just wondering because they are a very real threat here in Nebraska. I do have rabbits, not a lot but some. They don't bother my vines, probably because there's no green growth down at their level. They're probably happier in the tomato gardens. I am scared...the rabbits are brutal. I have to be really careful what I plant. They wipe out anything which is not behind a fence. I don't know if I can take training these things all summer only to have them destroyed. The vines I ordered growing well and they vary from 3 inches past the top of the grow tube to about a foot. I do have one vine which is not like the other kids. I am not sure what variety it is...but it is clearly not St Croix. The leaves and flowers do not have any red present and the plant is a couple weeks behind the St Croix. I guess I will just let it grow to see what it is. My wife and I went out to a vineyard this past weekend local to here and it was very neat. Anyway...I have rambled on long enough...take care and enjoy the holiday weekend. Dave I'm brand new to growing grapes but watched your pruning video and learned a lot. I just planted 10 cab franc vines and I'm using the bluex grow tubes. All vines have started to bud, Do I have to prune this year at all or wait until next spring. I live in mid michigan and fell in love with cab franc wines from the traverce city area. Thanks for visiting! Cab Franc is an excellent variety for cool/cold climates that can marginally support vinifera. If you planted this spring you can either pick the strongest shoot( when growth really kicks in) and remove all others, or you can just let the vines grow and next year pick the strongest shoot(cane) that survives winter and prune off all others. It's a matter of preference. If you let one shoot grow this year you should have your trellis wires in place and cut the growing tip about 3" past the lowest wire and then let lateral shoots grow. If you are not sure what to do, let the vines just grow and prune next year. Best of success in your vineyard. Stop back again soon! I never mind answering questions, always feel free anytime! Whether to "pinch off" the growing tip depends on the vigor of the vines. If they seem to be growing vigorously, then I would pinch of the tip an let lateral shoots grow this year. that way your training system is in place for next year. If they are not growing very vigorously, then just let them be and do dormant pruning in the spring. The training method is really a matter of preference and site characteristics. Foch has a semi-upright growth habit. Thus you could go either upper or low-wire training. Both have advantages. Mine are trained to low-wire canes. It requires a little more tying of shoots to the wires to do this, but I feel it gives me a nice even canopy of growth and good sun exposure. I don't mind the extra work of tying. I have had excellent results ripening foch this way. Top wire canes/cordon is a good system as well because the fruit gets excellent exposure to sun and the shoots will hang down on foch as they elongate. it will require wider row with and more effort to keep the canopy organized because the shoots will grow out, then down. It can also produce high quality fruit and there will be no tying of shoots to the catch wires (less work). Canes or cordons again is based on site characteristics. If you have a chance of winter lows below -18f to -25f, use canes end of story, cause you could get bud and or cane damage. So replacing canes each year keeps healthy wood in place. If there is no threat of winter damage and you have a very vigorous site, you may want to use cordons with spurs. You will have more shoots and clusters and thus slower ripening than with canes. This can give you a nice slowly ripened crop if you have a balanced vine. You'll also get a little larger crop. A low vigor site responds well to canes, faster growth and faster ripening. I thought your video was superb, simple and informative. I have started a small vineyard on my allotment in NORTH LINCOLNSHIRE-ENGLAND. I am going to use the double guyot method and planted 64 vines this year. I will post you some photos later in the summer. Hi again, Just to say I have Solaris and Marechal foch vines and would welcome any comments from anyone with experience of growing these varieties. Thank you for the kind words! Glad you enjoyed the video. Please stop by again and let us know how the vineyard is going. You should update some pictures...I am curious to see how the vines are doing? I have just stumbled across your site and the excellent videos and thought I would drop you a line and ask if you can help. We live on the south coast of England (in Brighton) and last year we moved 50 yards up the road into an old house belonging to an old gentleman we have known for more years than I would cheerfully own up to. The house is an old Victorian one built in 1893 with a 129fot long south facing rear garden. Attached to two sides of the house is an old Victorian conservatory and at one end there is a grapevine that was apparently planted through the floor into the ground underneath on the day the house was completed in 1893. The guy who lived here has done so man and boy for more than 67 years (latterly) on his own and he charged me with ensuring the vine lives on. Its obviously OK because we get about 60 - 70 big bunches of huge black grapes which are like balls of liquid sugar. Absolutely fabulous. However it is just a mass of old wood and shoots and although the conservatory is quite high the mess is quite low and I would really like to prune it so that the vine is higher and the whole set up more open as we do have a continual battle with mould and grape split. The variety is apparently Homburg (not sure of spelling) and was brought in from Germany by the original owner. We also have a very vigorous one (the same variety on the outside south wall which has lots of fabulous greenery but no grapes (well a couple of small bunches). Could I send you some pictures or a video and ask for some help. I won't be offended if you say no and I will keep looking at your website, but I do need a little help as I really don't want to kill it. My email if you want it is terry@buriedmoon.co.uk and I would be very grateful for your help. Sounds very interesting. I'll be happy to offer some pruningadvice if I can. I'll drop you an email. Thanks for the kind words and for visiting my blog. Was looking for info on pruning my backyard leisure vine, found your most excellent video and I now have a better understanding of the principles. Bravo! I'm going to look round. It looks like an incredible site. Great video, thanks for showing the double guyot method! You guys are experts, I am an older SUPER NOVICE, just gathering and storing information for my future backyard vineyard. This was a really great video!! 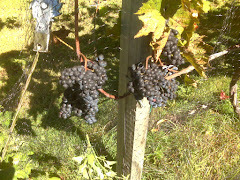 Hi, the vines are doing well and am ready to start pruning at end of January. I have ordered 50 more vines to come in April which are Rondo and will use the same Double Guyot training method. It is so simple. I had harvestable vines this year and am fermenting grape juice--Great feeling. Will let you know what my first vintage tastes like when I get it bottled. I've a mass of white Solaris grapes this year and are now ready for harvesting...On 45 of these I am hoping for around 40 bottles. My Rondo is coming up to the end of it's 2nd year and will prune in January and hope for a harvest next year.